Funtimes magazine publisher Eric John Nzeribe brings more than fun times to an African immigrant neighborhood in West Philly. The African nation of Liberia was deeply entrenched in the country’s first civil war in 1992, and the capital city of Monrovia had been overthrown and lay in ruins. Out of this devastation rose a new hope, however, and a way to escape the agony. This hope came in the form of a light-hearted Philadelphia publication, Funtimes. The magazine promotes laughter as the best way to cure people’s misfortunes, specifically African immigrants in West Philadelphia. 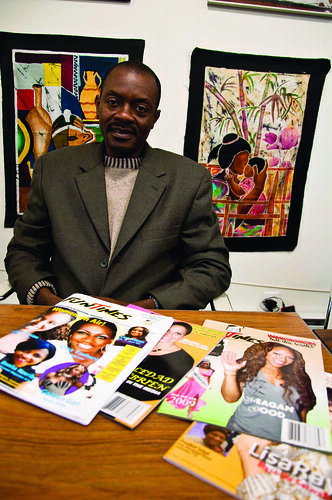 Funtimes founder and publisher Eric John Nzeribe is an entrepreneur and distinguished leader in the African community. Nzeribe continues this mission through the bimonthly publication of Funtimes. The magazine caters to African immigrants, as well as those affected by the African Diaspora. According to the U.S. government census, there are more than 60,000 African immigrants in the greater Philadelphia area. Many of these people are refugees who have fled their nations because of civil war, corruption, poverty and political persecution. The magazine has been making people smile for almost 18 years with its good-humored content that comes in the form of witty jokes, amusing stories and even comic strips. Funtimes often includes satirical cartoons of current political events and figures. The look of the publication itself is vibrant. Each magazine is energetic in appearance, often pulsating with an array of bright colors, and includes lively cover art that features a person of interest to the African community each issue. The fonts and headlines are eye-catching but typically easy to read. Funtimes features an abundance of festive photos of the African community; colorful borders and backgrounds highlight these pictures giving them a pleasing veneer. While the magazine is mostly uplifting in format and content, it does not fail to recognize the continuing hardships of the people who initially inspired it. Funtimes incorporates heartfelt depictions of the people currently suffering in Liberia, Haiti and other struggling nations. Funtimes has been operating in Philadelphia for almost two years now and manages offices in Monrovia and London; however, it has remained community-oriented and sponsors local events, such as the Miss Black America Pageant and the Multi-Cultural Affairs Congress. Funtimes often publishes letters from its readers giving their thoughts on the magazine. Letters such as these allow for the community’s input into the publication. Despite Benishay’s criticism, Funtimes is not all fun and games, as it also contains an array of informational content. “We are a conduit of information, education and entertainment to the African community and the Diaspora,” Nzeribe said. This information includes advice on immigration issues, job searches and social networking for the African immigrant community in Philadelphia and abroad. With the economic recession in full swing, many immigrants are in need of a boost. “It seems like a very good fit to add something like Funtimes,” said Nzeribe, who writes a one-page editorial that updates the Funtimes community on recent events each issue. Professional journalists and community members report the majority of the content. These contributors range from practicing doctors to enthusiastic reverends. The magazine’s health awareness section examines health issues such as sickle cell disease, HIV/AIDS and other sexually transmitted diseases. It also includes recipes for healthy and delicious meals such as “Ghanaian Jollof Rice,” African chicken with rice. The recurring “Dear Aunty Mamie” segment encourages readers seeking help with their personal problems to write in and receive advice in return. Funtimes also covers critical social issues like religion, poverty and politics. The magazine provided extensive coverage of the tragedy in Haiti as well as the election of President Obama. Funtimes analyzes President Obama’s strategies as well as other government policies that affect the immigrant community. Poverty continues to be a difficult reality for the community, but Funtimes often portrays this issue in an optimistic and encouraging manner. In its coverage of religious issues, Funtimes remains open-minded and acknowledges all forms of Christianity, including the Baptist, Catholic and Protestant faiths, and regularly refers to the Muslim faith. In addition to the magazine, Funtimes runs its own website at FuntimesMagazine.us. The website serves as an extension of the magazine with the same vibrant, upbeat character. It includes photo galleries and video from sponsored events, exclusive blogs and an online magazine archive. The story of Nzeribe’s establishment of a human-interest magazine in a war-torn city is nothing short of incredible. Funtimes is now approaching its goal of 10,000 international subscribers. With the recent opening of a new office on 52nd Street, the light at the end of the tunnel just keeps getting brighter for Funtimes. Jeffrey Janiczek can be reached at jeffreyjaniczek@temple.edu. The team, which has received national prominence, is one of 43 teams in an international competition. This is a great article! It is very well written and Mr.Nezeribe is very inspirational! I throughly enjoyed reading this. As a staff writer for Fun Times magazine, I truly appreciate the authors description of FunTimes. Eric Nzeribe has truly used his skills and talents to provide a more diverse and positive view of African/Carribean people. What should also be noted is that FunTimes Magazine is truly international in scope. Its readers are not only those of African descent but represent a broad spectrum of the world population. Everyone, regardless of their national origins, race or ethnicity will find our magazine both informative and entertaining. Thank you for your article, Jeffrey. Thank you for this great article. The ancient ones are proud. Thank you for the exposure you have provided for our magazine. As a minister of the gospel of Jesus Christ, I am honor to write for FunTimes Magazine as a witness of Jesus Christ love for humanity. I was in Toronto this past weekend, at a Christin Women’s Forum, and had the opportunity to minister to women from Canada, the Carribean, Europe, and India, and yes they too enjoy reading FunTimes. FunTimes is a great publication which is finding it’s home in Philadelphia, but it reaches over cultures, borders and boundaries. It addresses serious and light issues that always effect our ever changing communities. Keep up the great work, Temple News and FunTimes Magazine. This is a good article. Funtimes is a very nice pubication, although not fully in Nigerian market, but those that have come in contact with it love the Magazine. The contents, prints, quality and pictures are superb. Keep it up.